The annual Sapporo Snow Festival kicked off today in Japan. 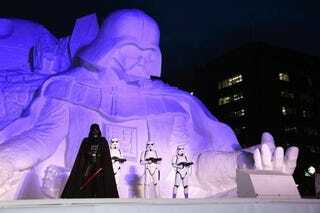 The center piece is an enormous Star Wars snow sculpture that looks like the Empire's take on Mount Rushmore. According to IT Media and Game Watch, the Star Wars snow sculpture measures 15 meters tall, 22.6 meters across, and 20 meters deep. Taking around a month to complete, the snow sculpture was built from seven-hundred 5-ton-trucks' worth of snow. That's a lot of snow—in fact, it's the most snow ever used for a snow sculpture at this festival. Two thousand people worked to complete this! The Sapporo Snow Festival runs until February 11 in Sapporo, Japan.